This new series of free public lectures on subjects of general interest in information engineering and science. National and international leaders in information technology discuss important issues relevant to everybody in the twenty-first century. Hosted by the School of Electronic Engineering and Computer Science at Queen Mary University of London, and generously sponsored by IBM. Ada, Countess of Lovelace (1815-1852) is best known for a remarkable article about Babbage’s unbuilt computer, the Analytical Engine. This not only presented the first documented computer program, but also, going well beyond Babbage’s ideas of computers as manipulating numbers, outlined their creative possibilities and the limits of what they could do. Lovelace’s contribution was highlighted in one of Alan Turing’s most famous papers “Can a machine think?”. The comprehensive archive of Lovelace’s papers preserved in Oxford’s Bodleian Library displays Lovelace’s wide scientific interests in everything from geology to acoustics to chemistry to mesmerism to photography; her exchanges with leading scientists such as Faraday, Babbage and Somerville; her correspondence course in mathematics with De Morgan, a leading mathematician of the day and pioneer in logic and algebra; and her grasp of the potential of mathematics whether to model a “calculus of the nervous system” or as a uniting link between the material and symbolic worlds. 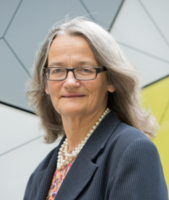 Professor Ursula Martin CBE is a Professor in the Mathematical Institute and Department of Computer Science in the University of Oxford, and a Senior Research Fellow at Wadham College Oxford. She has worked in algebra, combinatorics and logic, and currently with sociologists to understand patterns of mathematical collaboration. In 2015 she curated the bicentenary display of Lovelace’s papers at the University of Oxford’s Bodleian Library. Further information about the event.